A house of one's own. Located in the residential area of Guadalajara (México) in a land of rugged topography and a peculiar geometry, Casa VR is a two floors house, opening to a courtyard filled with trees and plants: a perfect retreat, a house of one's own. Designed by Alexanderson Arquitectos, a Mexican architecture studio specialized in residential projects, Casa VR's project was conceived from the the idea of garden, with the clear intention of reproducing the sensation of living among trees, in a constant contact with nature. 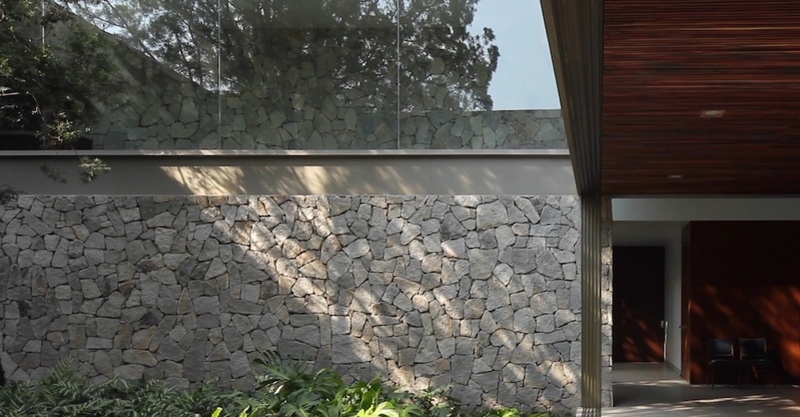 Juan Benavides, founder of FILMATICA, shot this short video to present the building in its main features: the perfect balance between interior and exterior, the light design that offers this place an intense illumination, the use of plants and trees to provide shade and regulate the temperature inside the building and the contrast between the use of grey stones, the greeneries and the warmth of the wooden interior. Two main axes divide the different areas of the house (day-night), while the prominent staircase serves both as an entrance and reception and also to separate rooms from facilities. They also lead on the roof of the house, where a swimming pool awaits its divers. The 50s lines are here renovated by the architects, who use a classical touch and bright it up with a careful choice in interior and exterior design. The landscape views are always framed by strategically located windows and large sliding windows that emphasize the lush green vegetation. The atmosphere of the house was conceived with the intention of creating a sense of warmness through the use of specific materials: stone, wood, marble and earthy colors all together produce a cozy sensation and enrich the homely atmosphere.